SoloPower Funding: U.S. Poised To Hand Over $197 Million To Another Solar Panel Start-Up | "Global Possibilities"
LOS ANGELES, Sept 24 (Reuters) – A tiny solar company named SoloPower will flip the switch on production at a U.S. factory Thursday, a major step toward allowing it to tap a $197 million government loan guarantee awarded under the same controversial program that supported failed panel maker Solyndra.SoloPower has initiated a strategy to differentiate it from struggling commodity players in the solar panel industry. Still, there are several similarities between SoloPower and Solyndra – which became a lightning rod in the U.S. Presidential campaign this year after taking in more than $500 million in government loans and then filing for bankruptcy. Like Solyndra, SoloPower is a Silicon Valley start-up and uses the same non-traditional raw material in its solar panels. And, like its now-defunct peer, SoloPower is one of just four U.S. panel manufacturers to clinch loan guarantees under the Department of Energy’s $35 billion program to support emerging clean energy technologies. The DOE payments to SoloPower will come on top of the $56.5 million SoloPower has collected in loans, tax credits and incentives from the state of Oregon and the city of Portland, where its first factory will be located. And, perhaps most importantly, SoloPower is entering the market at a time of cutthroat competition from cheaper solar products made in China. Though global demand for photovoltaic solar installations is expected to grow about 8 percent this year, rapid expansion of panel manufacturing in Asia in recent years – combined with a pullback in government incentives in key European markets – has left a glut of solar panels in the market, sending prices down 30 percent this year alone. Companies that make those panels are now struggling to survive. Even the world’s largest solar panel maker, China’s Suntech Power Holdings Inc, warned on Friday that it may be delisted by the New York Stock Exchange because its share price, which reached $90 in 2008, is now less than $1. Debt-heavy Suntech has also been hurt since it said in July that its partner in a solar development fund might have defrauded it with a bogus collateral pledge of hundreds of millions of German bonds. These struggles have heaped political pressure on the sector. Republicans, intent on taking back the White House in November’s election, are using Solyndra and other U.S. Department of Energy loan failures to brand the Obama administration’s green incentives a waste of public money and fountain of cronyism. Solyndra, for instance, was backed by George Kaiser, a major fundraiser for Obama. As the failures accumulate, Obama is under pressure to show better results for the program. Earlier this month, the Republican-controlled U.S. House of Representatives passed a “No More Solyndras” bill that would phase out the program for energy loans. It is highly unlikely to be taken up by the U.S. Senate or signed by Obama. SoloPower says the comparisons to Solyndra are unwarranted. The San Jose, California company’s lightweight, flexible solar panels have a unique advantage, Chief Executive Tim Harris said in an interview. They are pointed squarely at commercial and industrial rooftops that can’t support traditional panels, according to Harris, who said half of the buildings in the world can’t bear the weight of heavy, rigid panels made with silicon. This includes many of the buildings that house warehouses and big box retailers, Harris said. In addition, he said SoloPower panels are commanding a price premium in a market that has become increasingly commoditized. “We have way more demand than we have capacity at a very substantial premium price,” Harris said in an interview. He declined to specify the premium SoloPower is able to charge, but said his company’s product is best suited for markets such as Japan, Italy and Korea, which have high electricity prices and favorable incentives for rooftop systems. The company has been able to raise more than $200 million in venture funding from investors including Crosslink Capital, Hudson Clean Energy Partners, Convexa Capital Ventures and Firsthand Capital Management. But some in the industry are skeptical of SoloPower’s ability to succeed without having to lower its prices to compete with cheaper products from Asia. SoloPower must have its first production line up and running and meet other undisclosed milestones before it can begin to draw down funds from its U.S. Department of Energy loan guarantee. Harris expects that to happen later this year or early next year. Funds from the loan guarantee will pay for construction of the rest of the Portland, Oregon factory, which is expected to be completed in 2014. DOE spokesman Damien LaVera would not provide details on the terms of SoloPower’s loan guarantee and said the company’s technology was not similar to Solyndra’s, but would not elaborate. Once completed, the plant will produce 400 megawatts of solar panels annually and employ about 400 people. There are 60 people working there currently. SoloPower will be profitable once the first line is up and running producing panels, Harris said. Many solar companies, meanwhile, have been losing money as they scramble to cut costs as quickly as the prices on their products are falling. Solyndra, for its part, drew down 99 percent of its $535 million loan guarantee without turning a profit. Some project developers, bankers and others are wary of newer “thin film” solar technologies like SoloPower’s that are less efficient than traditional panels at transforming the sun’s light into electricity. Thin film, a broad term for solar panels that don’t use silicon as their raw material, became a darling of investors five years ago when solar-grade silicon prices soared to $500 a kilogram. Thin film makers argued that despite their shortcomings in efficiency, they could deliver far cheaper solar power than their silicon-reliant rivals. Today, however, an influx of capacity from Asia has driven spot prices for polysilicon to about $20 per kg, raising questions about the need to fund alternatives to silicon-based panels. Like Solyndra, SoloPower’s panels use copper indium gallium selenide, or CIGS, as their raw material. CIGS panels have long held the promise of being cheaper than polysilicon-based panels while delivering efficiencies that are higher than other thin film technologies such as cadmium telluride, the raw material used by U.S. solar heavyweight First Solar Inc. The drastic drop in the price of traditional panels over the last few years, however, has kept CIGS manufacturers from delivering on that promise on a commercial scale. In the last year, CIGS solar companies HelioVolt and Ascent Solar Technologies Inc have sold stakes to South Korean conglomerate SK Group and TFG Radiant Group, respectively. Another, Miasole, has cut staff and said publicly that it is searching for a partner. Rival Nanosolar earlier this month said its chief executive left after just eight months. Though Solyndra is the best known solar failure of the last year, it was far from the only one. 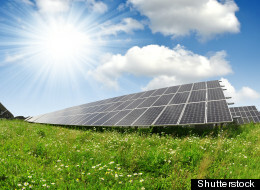 GTM Research estimates that the United States produced 281 megawatts of PV modules in the first half of 2012, compared with 561 MW in the first half of 2011. That’s a big reason why a string of manufacturers in both the United States and Europe have closed their doors in the face of competition from increasingly cheap Chinese panels. First Solar, for example, postponed indefinitely its plans for a second U.S. factory in Arizona because of the weak market conditions. Start-ups are being hit too. Of the four companies that received loan guarantees for photovoltaic solar manufacturing, two – Solyndra and Abound Solar – have filed for bankruptcy. SoloPower and Lexington, Massachusetts-based 1366 Technologies Inc, which received a $150 million loan guarantee, remain. 1366 also has yet to draw down funds from its loan guarantee. Even the Chinese manufacturers, whose products are the cheapest in the world, are losing money and struggling with ballooning inventories. One of the biggest Chinese solar companies, LDK Solar Co Ltd, said earlier this month that it was looking to raise cash and may sell a strategic stake. For its part, SoloPower has hired Macquarie Capital to help it explore partnership opportunities. Such a deal could include giving distribution rights to a European or Asian partner in return for a stake in the company. SoloPower is not up for sale, however, Harris said. In fact, the company could even pursue an initial public offering next year, Cavalier of Hudson Clean Energy Partners said. “If the capital markets come back next year, I think we will be able to articulate the value that we offer to potential IPO investors,” he said.